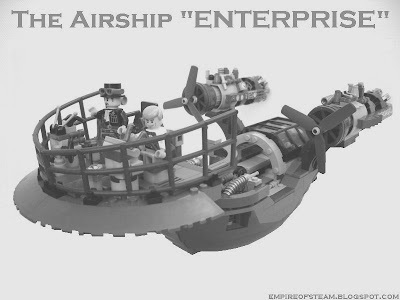 "These are the voyages of the airship 'Enterprise'. Its five-year mission; to seek out lost worlds and lost civilisations, to boldly go where no man has gone before..."
For four and a half years, readers would wait impatiently for the monthly extracts from the journal of charismatic ship's captain Tiberius J. Kirk. The intrepid explorers' discovery of ancient ruins and artifacts across initially Southern America, and then the uncharted hinterlands of Asia, was to provide the backbone to a thrilling collection of stories. The last communication from the Enterprise was to arrive in London in June 1862 - only three months before the ship was due to reach the end of her five-year mission. No-one can be sure exactly what happened to Kirk and his crewmates; Professor Bonaparte McCoy and engineer Mister Scott. However, rumours persist that the Enterprise fell victim to some sinister Manchurian plot. Perhaps one day, a new generation of explorers will find the wreckage of the Enterprise deep in some steaming Asian jungle, and the mystery will finally be explained. A collection of illustrations of the Enterprise are published here with the kind permission of the proprieters of The Strand magazine.